This is the second Nero Wolfe mystery, and one of the better ones. 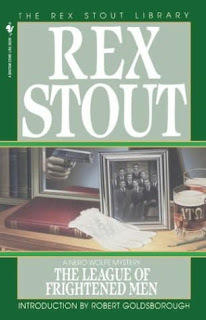 This novel and Fer-de-Lance1 (the first) were the two selected from Stout's canon for inclusion on the Haycraft Queen Cornerstone2 list of influential crime fiction. In my readings so far, these are indeed the two most worthy. The story is enjoyable and somewhat unusual. A group of college associates are being threatened by one of their own, with good reason to believe it is the author and playwright that was accidentally crippled in one of their college pranks. Two men are dead, with the strong implication from harassing letters that it was murder. Now another man is missing, a man who had come to Wolfe for help and been turned away. Wolfe wants to cajole the whole group to sign on (and pay up) to have the case solved. As always, Wolfe is staying put, his investigations take the form of reading the potential culprit's books and plays. The street-level action is left to narrator and sideman Goodwin and a long standing group of contract footmen. Like many of the Wolfe stories, the business angle is as much a part of the intrigue as the crimes. In fact, in this story, Wolfe's chess game with his clients easily takes up as many words as the putative crimes under investigation. Or perhaps I should say, a key dimension of the mystery here is how Wolfe plans to lure customers and execute his contracts. The artful turn of phrase that I enjoyed so much in Fer-de-Lance is less present here, though not gone. Stout came to these two novels after a series of failures at writing literary fiction, and you can tell. At times playful with sentence and imagery, the narrative feels much more like Archie's voice than the later works I have read. Later works, like The Doorbell Rang seem to have narrative language that melts away from the reader and lets the action sit in the foreground largely unadorned (though the dialogue remains fairly sharp and contorted). Knowing little about Stout's progress, I am inclined to believe that his sense of his audience (boys and young men) evolved, and he dialed up the action and dialed down the language play. This certainly makes the later works more accessible. While he never strips matters to the dial-tone dumb of a Hardy Boys novel, it has dampened my favourite dimension of his work. As with many of the Wolfe books, don't try to figure out the motivations of any of the secondary characters. The secondary characters are scenery, and trying to understand them as people is like wanting backstory for the fire escape. Actually, given some of Stout's notes included in this series's printing, I think that the fire escape is more likely to have backstory than most of the characters. The Haycraft Queen Cornerstone is a list of influential crime fiction written before 1952 (when the list was last amended).